In this unrehearsed improvisational performance I am exploring time, relation, the visual properties of sound, and ways of disconnecting conscious thought from the process of art making. The ubiquity of banjo type instruments in many cultures—particularly African cultures— has always interested me as a portal into ideas of the interconnectedness of creativity, imagery, culture and storytelling. 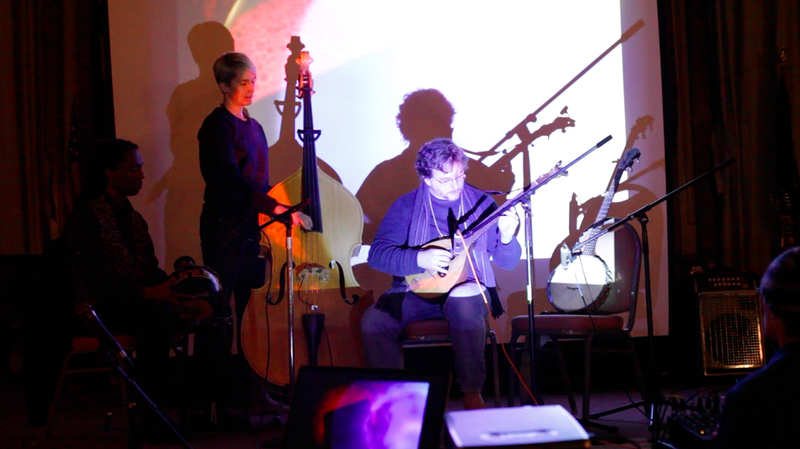 Cliff Berrien (Udu) and Nikki Juen (bass) and I had never before played together. In fact, Nikki Juen had never played bass at all. Our conversations about music and visual art and attempts to free the consciousness from practice were the precursors to this performance. She had been creating pieces while drawing with both hands simultaneously and so, as part of the larger conversation, I wanted to attempt something similar with sound. At 1:07 I attempt to play two banjos simultaneously. This video was recorded January 26, 2015 at Vermont College of Fine Arts.